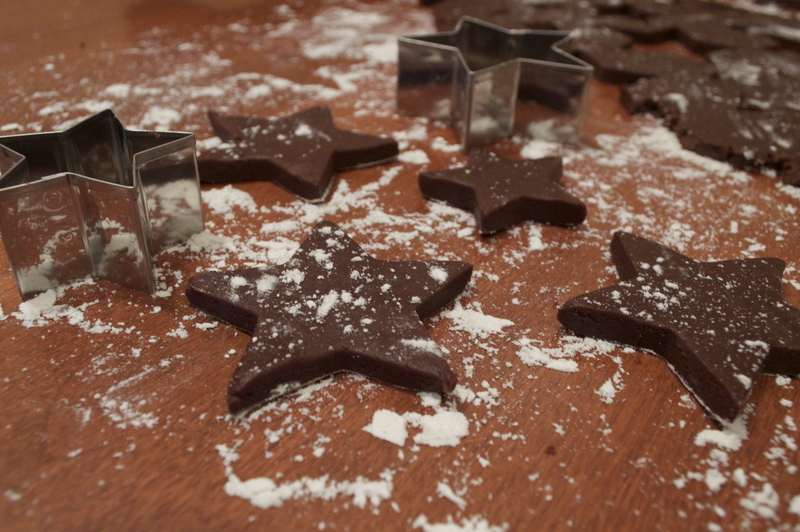 After many ill-fated attempts, I finally found the perfect chocolate sugar cookie recipe. This dough stayed firm enough to make all my cutouts in one shot without having to put the dough back in the fridge before rolling it out each time. And as an added bonus, there’s espresso in the mix. Coffee and chocolate – does it get any better? 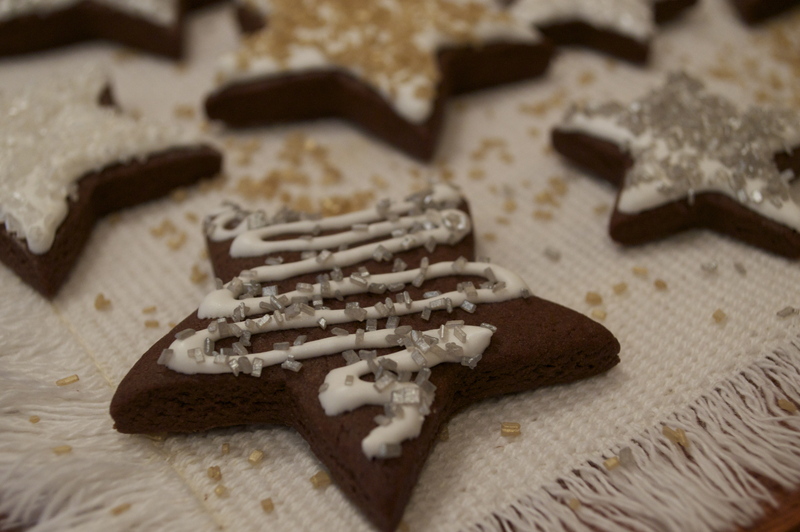 To start, whisk together the flour, salt, baking powder, espresso powder, and cocoa in a large mixing bowl. In a separate bowl or stand mixer beat the butter, brown sugar, egg, and vanilla extract until fully incorporated. Then add the dry mixture into the wet ingredients in small parts, mixing until combined after each addition. Form the dough into a disk, cover it with plastic, and place it in the fridge for at least an hour. I left mine over night, and it was the perfect consistency. After the dough has firmed up in the fridge, preheat the oven to 350°F. Roll out the dough on a well-floured surface until it is about a quarter of an inch thick. 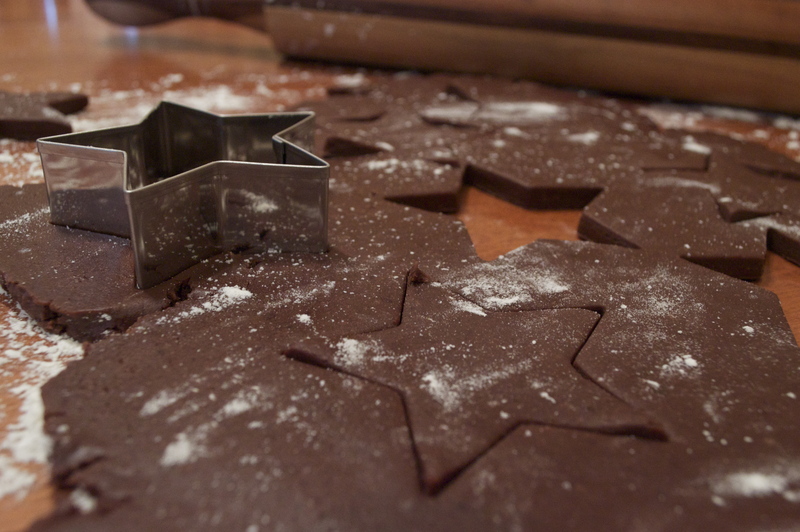 Then use your favorite cookie cutter to cut out cookies and place them on an ungreased baking sheet. Bake the cookies for 8-11 minutes, or until the edges feel firm. Since chocolate cookies are already brown, you can’t tell they’re ready by the color. Take it from someone who has overcooked many batches of chocolate cookies, make sure you touch the edges to feel when they are done. Once the cookies have cooled on a rack, they are certainly ready to eat (and I’m sure the decadent smell of chocolate seeping from your oven will have your mouth anxiously awaiting a bite), but a sugar cookie just isn’t a sugar cookie without some icing. Follow the instructions on your container or meringue powder to activate the powder with water. Then add the vanilla extract, and beat the mixture until frothy. Add the sugar and beat on low speed until incorporated, smooth, and glossy. Continue beating on high speed until the icing stiffens, about 5 minutes. Decorate to your heart’s content, brew a fresh pot of coffee, and enjoy. Remember: never stop your light from shining. And (more importantly) never stop eating cookies!